Close your eyes and image yourself sitting on the waterfront of an award winning restaurant, overlooking the bay, as the sunsets over the water. As you browse the menu, you discover multiple modern American cuisine options and some of your favorite international wines. The waiter approaches your table with your meal and wine in tow. After satisfying your taste buds at one of Tampa Bay’s hidden jewel, you decide to hop onto the water-taxi as you sail into under the moonlight. Now open your eyes, and get in your car and drive to Harbour Island, located in Downtown Tampa and head to Café Dufrain. This Tampa jewel is located less than 2 miles from Downtown Tampa. Café Dufrain offers guest seasonal menus, offering a variety of dishes and seafood options. This is a dining experience offers a sustainable menus, and 75% of the menu items are organic or locally grown, even the seafood. Looking for an alternate way to dine? Café Dufrain has a new open air dining room and two climate controlled patio areas, which can accommodate parties of 2 to 125. For those who wish to use water as their method of transportation, Café Dufrian has boat access from the Garrison Channel. Join Café Dufrain on Wednesday, October 2nd for their unforgettable Five Course Beer and Food Pairing. 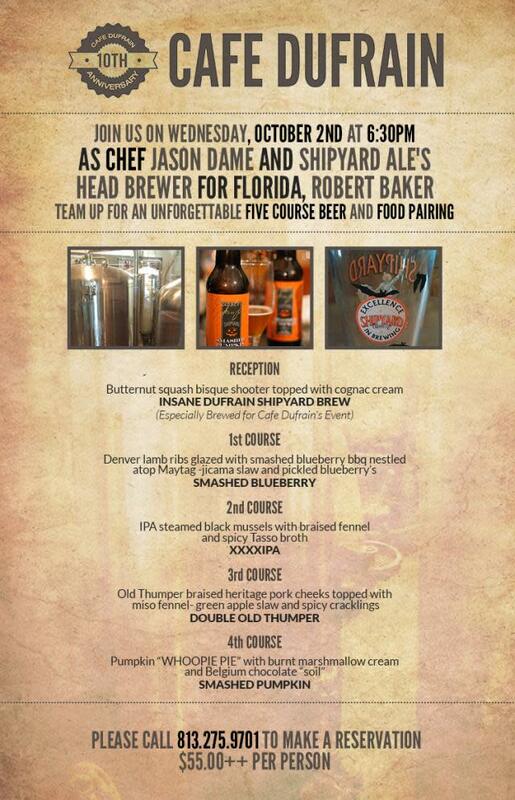 This event will be moderated by Café Dufrain’s Chef, Jason Dame and Shipyard Ale’s Head Brewer for Florida, Robert Baker. This is one of many events that you do not want to miss!